This morning I ran with the L St running club. We did the Emerald Necklace Run. This is one of my favorite training runs because we get to run in the Arnold Arboretum and paths along the Riverway and the Charles . There is a spiraling trail in the Arboretum that goes up Bussey Hill. It’s only 150ft high, but is fun passing by runners as they are going up or down the hill. Unfortunately, we could not run most of the highlighted routes including Bussey Hill this morning. The paths had so much ice on them, they would be better used for ice skating. We were forced to run on the streets which might not be safe but it seemed safer than running on the ice. 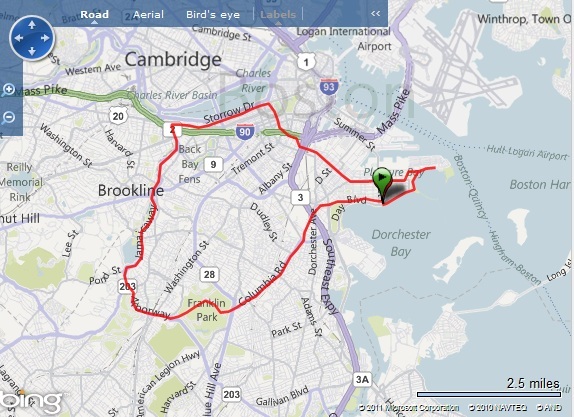 This cut a few miles off our goal so we decided to run around Castle Island at the end of the run to make up for it. Besides not being able to do the route as planned, it was a great day. It was sunny and seasonably warm. I think when we finished it was around 36°. I definitely overdressed. I had to wrap my running jacket around my waist half way through the run. Everyone seemed happy about how they did today. Next week we bounce down to 12 miles to give ourselves some time to recover before we start tackling long distances and more hills. I guess that’s it. Have fun it school this week and I’ll check in soon!